It’s time to get personal with your marketing strategy. Today’s digital marketing tactics are focused on customizing the client experience to make each interaction meaningful and valuable. 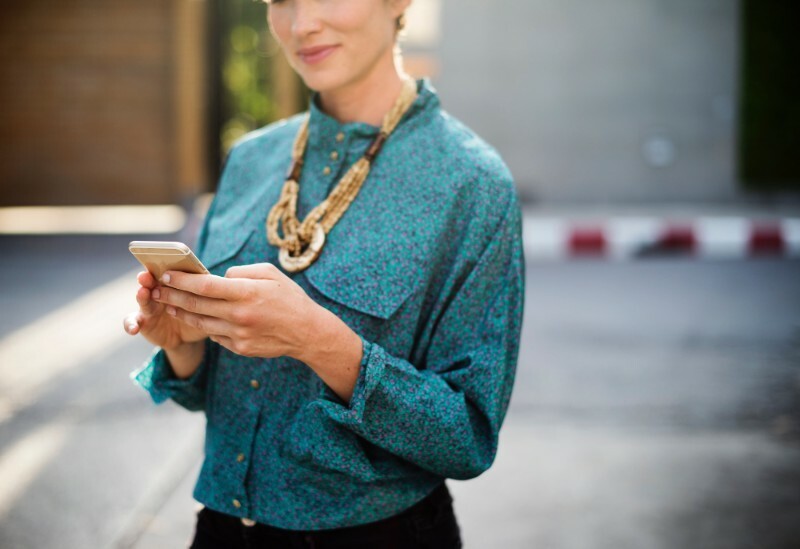 There are simple, cost-effective and non-spammy ways to make your customer feel like one in a million, one of the easiest being personalized text messages. Personalizing your text messages makes your customers feel good (if you do it right) because it helps you say something that’s actually helpful and targeted. Doing so could also help you see better business results from text marketing. Your campaigns should be as effective as possible, so why not try every possible marketing strategy to improve them? Here’s everything you need to know about sending personalized text messages and how to get started. How do personalized text messages help your business? Keep the people happy: 71% of customers get frustrated when their experience isn’t personalized. Uphold expectations: 54% of consumers expect a personalized discount within 24 hours of giving their information to a brand. Drive impulse purchases: 49% of consumers have purchased something they didn’t intend to after receiving a personal marketing message about it. A full 85% of these impulse buyers said they were happy with their purchase. Surprise and delight customers: 77% of consumers expect online retailers to personalize their experience. Local businesses aren’t off-the-hook: 34% of consumers expect local businesses they frequent to personalize messages directly to them. Create brand evangelists: 44% of customers are likely to become repeat buyers of a brand that personalizes well and 39% are likely to tell friends and family. Mass text messaging doesn’t have to be generic. Personalizing your marketing messages drives brand loyalty by making customers happy and giving them information and incentives that are actually valuable to them. There are so many creative ways to personalize your text messages. Here are just a few ideas to get you started. Take these ideas and make them your own. Hi, [NAME], how was your dinner [RESTAURANT NAME?] Please rate on a scale of 1 to 5 stars. Hi [NAME], how are you liking the [PRODUCT] you ordered last month? Could you take a moment to rate it now? Hi [NAME], we haven’t seen you at [GYM NAME] since [DATE]. Ready to come work out this week? Winter is approaching, show this text to get a FREE battery and coolant inspection when you bring your [CAR MAKE AND MODEL] to get your winter tires on. Hi [NAME], looks like you haven’t had your hair cut and colored with [STYLIST NAME] since [DATE]. Schedule an appointment for next week: [LINK]. Hi [PET OWNER]. It’s time for [PET NAME] to get their yearly booster! Schedule an appointment now. Your trial for [THIS SERVICE] is about to end. Would you like to upgrade now to avoid a service disruption? We noticed you had a customer service support request on [DATE]. Were we able to solve your problem? Hi [NAME], would you like to order [FOOD ITEM] again for dinner tonight? Hi [NAME], we just got new [PRODUCT CATEGORY THEY LIKE] in store. Show this text before [DATE] for 10% off! Hi [NAME], your order of [PRODUCT] just shipped! Personalizing your text messages is a simple tactic you can begin to do immediately. Here are the steps to get started. You’ll first want to decide what criteria to segment your list by. Basic ways to segment are usually geographically, by gender or by age. Other more advanced strategies can include segments such as preference, date of purchase or actions taken (or not taken). If you’re just getting started, you can include these segmenting questions in your auto-reply when people opt-in to your text list. Or, you can include them as questions in your web-based opt-in form. 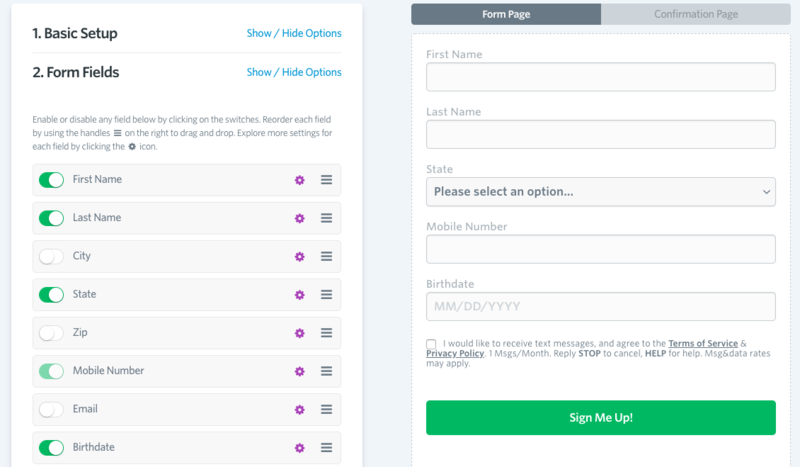 From the “marketing tools” menu, head to “create an opt-in web form” and then choose the fields that you want to appear in your form. If you already have a list and want to start segmenting it now, one great way to do it is with a survey. You can do this from your SlickText dashboard and add your own custom fields to ask any questions you’d like. Now that you have your list organized by segment, it’s time to create campaigns that target each segment. When you’re ready to send messages to each specific campaign, that’s where merge tags come in. Merge tags are a feature within SlickText that allow you to insert personal information directly into your messages. The merge tag is a placeholder that gets replaced with information specific to your contact when you hit send. Hi %%first_name%%, we’re giving away one free appetizer with the purchase of any entree in %%city%% this weekend. Show this text before 2/10 when your order at any of our %%city%% locations. Hi Jane, we’re giving away one free appetizer with the purchase of any entree in Michigan this weekend. Show this text before 2/10 when you order at any of our Michigan locations. A list of merge tags you can use within SlickText is available on our Help Desk. After you’ve tried a text message marketing campaign with personalized text messages, it’s important to measure your results. Keep track of how many people are redeeming your offer or clicking any links within the message. That way you’ll know if you need to make adjustments to what you’re offering or how you’re personalizing your texts. Don’t get personal information wrong. In the same survey above, nearly 60% of respondents said getting key information about them wrong, particularly their gender, is very off putting and can give them a negative impression of your brand. Check your data before you send a personalized message, or else you risk it backfiring. Don’t overdo it. No one wants to feel like they’re under surveillance from your brand. Keep your information updated. Trying to personalized based on information from years ago might create an awkward situation. People move, their preferences change and they evolve. You don’t want to advertise mother’s day flowers to a client who once purchased from you but whose mom has since died. You don’t want to send restaurant specials to a client in Orlando when they’ve moved to Tampa. In order to stay relevant, you need to be regularly checking in with your customers so you can tweak your messages to their current realities. Personalizing your text messages can be a great way to grab the attention of your customers and build a meaningful relationship. Get started with some of the basic techniques and when you’ve built an expertise you can try adding more advanced personalization methods to your arsenal.